Let’s Golf! 3 by Gameloft hit the market last week and has added some cool new features to the popular Let’s Golf! franchise. Let’s Golf! 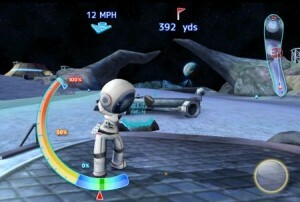 3 features 3D courses, far and exotic new locations (including outer space), multi-player options (play on same device now available), in-game chat and social invitations via Facebook, Gameloft Live, email and more. You can also create your own avatar with tons of combinations to choose from. Unlock new modes, and for a change of pace, you can play some challenging Mini-Game Mayhem games like Catch the Star, Target Range, and Putting Master. Play them all to perfect your skills and you’ll become a pro of the game in no time.